Any analysis of the object - outside the field of anthropology and its more recent offspring, Material Culture studies - has traditionally concentrated on the production of things by industry. This analysis has taken the form of market research, target sampling, advertising and statistics. Such a particular representation tries to identify gaps for the profitable manufacture of commodities, to effectively locate, isolate and eventually stimulate demand. Clearly this is a warped perspective, it may account for what, or how many things are in circulation, but it does not begin to offer any understanding of how they are actually used. The theme of this book lies in attending to things as they fall from the commodity loop into their rich and varied lives. How exactly are objects patterned with meaning and value, how for instance do they begin to trap historically transient experiences; like Love beads, Ben Shermans or safety pins. Most of our material world, like the iceberg, lies beneath the threshold of our comprehension. Things flow past and rest silently as a sediment shaping our consciousness. If our experience of time is dovetailed into the representation of the present, the object, like the pop song, can snare the fleeting moment as it falls away from memory. How people actually utilise things is extremely resistant to representation. I hope through the diverse contributions presented in this book, to establish and then play back some of the procedures of use, against tactics for art. I would recognise it is often only the shift in context, the suspension of utility, that separates the two. I want to begin by acknowledging the fact, that art objects` representational hegemony has been fatally threatened by the explosion of, and increased psychological investment in material things. No longer is it desirable, or even possible, to situate a boundary between reality and its representation. The strategy of playing dumb utility against the chatter of aesthetics has been tirelessly repeated during the past eighty years; it was Marcel Duchamp who initially slipped the urinal into the stream of aesthetic objects. What I suggest is more productive, would be to recognise that all objects can be brought to the level of speech, and to consider instead the mechanisms for producing and structuring meaning across the spectrum of material culture. The presence of an artefact, its relations, contexts, functions and associations, in short its rich life, concretely exists and simultaneously participates in a discursive and "textual" space. No object is a island - even the smallest grommet is named, its properties catalogued and printed, its efficiency or function can be discussed in magazines, its values and uses are swapped in bars, we could argue over its beauty, in effect it enters discourse. There is no autonomy for things however desired; an artefact inevitably grows a textual appendage. This parallel yet connected textual space intervenes in the realm of material things, it frames physically and conceptually at any given moment what may be possible. Driving a 500mm self-tapping Supa Screw into a sheet of Birch 5ply is not - as in this instance - merely a textual performance. A series of concrete actions may have taken place to construct the chair you are reading this from. What I want to bring to mind is the dependency of a text on a set of procedures that elude, or at least resist writing. It would be a mistake to take a particular act of transcription, for the practice itself. Nowhere is this more apparent than in the specific, detailed, local and concrete realm of things. The description of the Supa Screw action unfolds within its own material economy, is it additionally glued, jointed, bolted or nailed, is it capped, domed, chromed or countersunk. Is the head damaged by a blunt bit, slotted or Phillips ? Is the ply varnished, faced, stained, splintered, rough cut or sanded ? This potentially endless list of variables would allow you, the reader of the material text, to recognize if the chair is well, badly, carefully, sloppily, lovingly or mechanically made. What I want to underline in attending to this multitude of concrete difference, - which could be physically apprehended in an instant - is the impossibility inherent in transcribing a material syntax. This book recognises the inescapable condition of being neither contiguous with, nor totally separate from its subject, the field of physical material culture. No contemporary writing of the object could ignore the realm of the commodity, viral in its expansion; no host has been so receptive as the field of material culture. The recent decade seems to have been blinded by the lightness of the commodity. No longer perceived as the physical by-product of industrial production, or the despised excess of labour from Marxist analysis, the commodity is a universal solvent acting upon the boundary between all things. From houses`, water, body parts, transport, to a range of public services, these have all been commodified. The efficiency of hospitals, education and the police have been infected by a market driven logic: the imposition of trade sanctions - the withdrawal (a strike) of trading - is used as a weapon that precedes more violent hostilities. Democracy itself has been confused with the freedom to consume, witness the changes unfolding in Central Europe. The commodities` preferred mediums are markets - abstract or concrete - and their propaganda department, the advertising media. Commodity objects lend themselves to being severed from their material presence, they are easily flattened down into an economy of visual signs. De-materialised and transparent they wantonly slip and slide un-anchored in time or specific context. As passive carriers of meanings, as pure signs, they are at the mercy of a medium cynically dominated by 'life-style' advertising and the projected desires of targeted 'aspirational clusters'. Commodity discourse attempts to close the troubling irregularity of objects in use. In this respect the aim of advertising remains constant, to regulate, and control the production of meaning at the moment of the objects` appearance into a field of vision. The most base tactic is to eroticise all aspects of the object. For example, there is a wealth of difference between a carburettor and a plastic banana, their specific spheres of use would normally preclude their contact. But it is just possible to imagine advertising conflating the two in a sheen of soft focus seduction to more effectively enter their prospective markets. What I want to bring to attention here is that commodified objects yield easily to the play of semiotic analysis. Inseparable from the effects of their promotion, seductive in their excess and abandon, it is not surprising a media biased theorizing has accompanied the material excess of the last decade. As if to acknowledge the modern commodity as the most powerful collective site of representation, art practice has increasingly mirrored heightened strategies of consumption, in the form of extreme products. I am thinking of the American artists Jeff Koons or Haim Steinbach for instance. What these and other artists have done is to take the mechanisms of display, the transparent objects, the gloss, the greed, in short the language of commodity fetishization, and to feed them back into the advertising media. A kind of homeopathic tactic, where a concentrated or extreme product, something hopelessly thin and shimmering attempts to engender some temporary immunity to the whole market seduction. The difficulty, no, the necessity, if we are to move beyond this increasingly rhetorical position is to try and see through the glittering, reflective sheen of the modern commodity. Perhaps if we begin to chart the object's encounters in the babble of use, the natural resting place for invention and memory, we may encourage some resistance. Things here seem closer to their being, worn, expressive, stripped of hype and glamour, in the relative economies of use and need. This is where, I believe, an objects real life begins, moving from hand to hand, being bought, thrown out, collected, displayed, broken, sold, recollected and re-displayed. Something closer to the flea-market economy. The use of things, in its broadest sense, is not a space necessarily made manifest by their own production. It is clearly impossible for every individual to intervene at the level of manufacturing. Instead procedures have evolved for ways of articulating existing objects often imposed by a hostile economic order. I am thinking here of a whole spectrum of prosaic gestures, from assembling the furnishings for a room, to choosing what clothes to wear, or more obviously charged actions, for example black youths wearing deerstalker hats. In this sense, use can slip through prescribed material typologies. It is possible for instance, to walk consecutively through a museum, gallery, shop or flea market, browse through catalogues, magazines or newspapers, watch some TV, buy a hat, receive a present and find something beautiful in the street on your way home. What I want to emphasize and encourage here is not only the feeling of use or practice as a space untouched by advertising, but also a process for empowering the person who is subject to industrial production. Effectively, I am proposing switching focus and inviting everyone to step into the author`s, or producer`s place. There manifestly exists a syntax of use. Certain arrangements of things conform to our sense of propriety. I might recognise a beautifully made gesture - like the way cut tennis balls protect towing brackets on cars - as well as acts of transgression - plasticine used to stem the flow of water from a leaking pipe joint. These actions may constitute enunciation, a parallel to the construction of a verbal sentence, transposed to the material text. These momentary expressions, like the joke, pun, the apposite phrase, elude transcription and only conventionally enter vocabulary as they congeal into cliche. Coat hangers used as car aerials might be a good example. It would be foolish to propose a formal grammar of things. This may form part of the Design Museum`s project, similar to the conservative linguist who tries to impose the idea of proper usage. The best I can hope for is a momentary snap shot, in an effort to engender a heightened sensitivity to the articulation of the material lexicon. By attending to the rich collisions of objects, the playful frictions, the linguistic diversity of culture is mirrored in the dialects, slang, and vernacular of use. The relative economy of use may allow our attention to wander over the particulars of a material syntax, the joins, fits, slips and ruptures of material culture. The discontinued bags for your old vacuum cleaner may turn up in a flea market, next to the carved soapstone African head, 3/8 pop rivets, and that old Beastie Boys tape you once owned and gave away. Perhaps the repair, customising, DIY, improvisation, something recycled, all these activities would repay attention. This local inflection, generated by the friction of use, requires the most detailed reading, and is it seems to me, the most resistant to representation. How can we re-coup the abundant production of things that rest between self-conscious design, outside the morphology of tradition, or fall through the rationalism of market forces. What is left is the pink plastic suction hook that never works. This is not to retreat into the realm of kitsch, but to attend carefully to moments of industrial capital`s failure.Only here lays exposed, in the suction hooks re-inscription, the unauthorised inventiveness of use. Use in its purest sense - not the gift - is the inverse of the commodity, it does not yield easily to metaphor. A functional object has a metonymic relationship to meaning while in service, the effect and implementation of its function can be juxtaposed to produce a figure of meaning by contiguity. Outside of its immediate context, stripped of its function, in a museum, gallery, or photograph for instance, an object operates more conventionally like a sign in written language. While it is conceivable to theorize away any absolute value of use, Jean Baudrillard - amongst others - in his earlier writings, helped sever the link between a Marxist use value and the establishment of a concrete, absolute need. However, there remains the certainty, that an object we may call a parachute, at its most basic either works or it does not. The simple test is you either jump, plummet to earth and die or your descent is arrested and you survive. It is possible to play with the semiotic difference of those actions, to luxuriate in the endless possibilities of signification, but there is a bottom line, a referent, some resistance. The basic purpose of slowing a fall, brackets the form of a parachute ---it could not be made of sponge, or be completely rigid, or too heavy, etc,--- in some sense the form and action are reciprocally defining. Sharp things move more quickly through the air than blunt things. What I hope`s evident is that the relationship between form and function, or sign and referent, in use, fails to be arbitrary. I am straying close to an ideal of use most closely associated with a certain "high" Modernism. Perfect use would render the object invisible, this may be the ideal of Supa Screws, or Fischer Nylon Anchors, or microprocessors. Only in excess of their sublime function do they begin to represent. Unfortunately no degree zero of utility exists, there is no direct drive between form and function; a gap always exists. There is no ideal parachute. Use opens itself to language; corrupted, language frames use,the two enter a reciprocally binding relationship. Even the flawlessly honed edge spills over into metaphor, sharp as a razor. I have no desire to reintroduce a mechanistic relationship between form and function, nor do I wish to confuse a pure - Marxist - value for use, with the sense of resistance that I have suggested. I cannot pretend the grounding of interpretation within use will terminate the "semiotic free fall" of recent theory. It`s impossible to regulate for a useless corkscrew beautifully holding the door open. But I would suggest we can look to material objects that operate around the locus of function for some opposition. Use could begin to operate as a brake, generate friction and slow the constant acceleration of a media saturated interpretation. If the commodity is characterized by arbitrariness, use is not. I would like to step closer and pay some attention to the possibilities of physical materials themselves. There exists an infinite lexicon of characteristics`, rough, light, sticky, matt, porus, spongy, dense, hard, and myriad methods of construction, riveting, gluing, welding, screwing, etc. These properties can act as discriminants within a formal system through which meaning is structured. Simply put, rough means primitive, smooth means cultured. This lexicon of difference between materials, is obviously not neutral or fixed, but clearly structured by its immediate social and temporal context. The ability to differentiate, to structure meaning as it coalesces around wood products, metals, fabrics, and ceramics for instance is not to exclusively bind meaning to their physical attributes, but certainly to recognise affinities adhering to their particular characteristics. The properties of materials such as wood, are slowly learnt, sieved through experience, communicated across generations and accumulate within our culture. How do you arrive at the thickness of a Hickory hammer handle? Wood currently connotes something natural, old and domestic, it`s tensile strength is utilised in handles, doors, tables and chairs, it`s warm to the touch, stable, and cosily familiar. This rather nostalgic view of the slow accumulation of experience has in relatively recent times been framed and ruptured by the qualities of modern plastics. How can the fluid properties of plastic, the frightening diversity of its forms its endless potential for manufacture be accommodated into our slowly accumulated material lexicon? Plastics have no palpable, concrete signature. Wood was used for its relative lightness, versatility and tensile strength, but plastics are a changing continuum of often contradictory potential, transparent, opaque, porus, impervious, light or dense, spongy or shiny. Compounding this diversity of characteristics, plastics leave discrete traces of manufacture, not the all to visible joints, screws, glues, nails and bolts, the myriad fixings of a previous age. We are accelerating into the realm of complex moulding, Mylex, Styrene, Polyethylene and silicon all of which leave virtually invisible evidence of production. Look at any plastic toy it appears as if from nowhere, our level of manufacture has descended to the chain of its molecular composition. With time we are becoming more sensitive to plastics presence; as we see it bleached, faded and abraded on the beach, its frailties emerge. It ages rather sadly, the patina of time degrades rather than enhances its qualities. What`s glaringly apparent is almost any attempt to repair plastic products fail. Once broken, the thin synthetic skin gives no adequate mechanical fixing, it repulses all traditional techniques. Instead glues, solvents and a degree in chemistry are required. Inevitably we are persuaded to dispose of the object and purchase a new one. Clearly our engagement with modern products is less physically substantial, denied the play of the bricoleur, repair becomes obsolete, we are forced to retreat as intervention is removed to the level of consumer choices. Ominously the impact of plastic technology has reverberated through more established materials, wood has now mutated into M.D.F, Stirling board, Chipboard, and various compressed residue products. Wood is now a consistent material without grain, all the vagaries of nature are erased, its moving towards total fabrication. We are in real danger of loosing the ability to recognize the properties of our material environment. My intention in sketching the stereotypes of a material grammar is to expose the potential embedded in materials themselves. I have no desire to retreat into sentiment, I would prefer instead to hold contradictions up for scrutiny. To be familiar with the living syntax of material-in-use reaffirms materials as richly patterned with meaning. The relevance, it seems to me, lies in being able to recognize several distinctions simultaneously - economic, technological, ideological and philosophical - as they cling to the differences between, say, a plastic and galvanized bucket. A material lexicon, like the constantly revised dictionary, momentarily frames the possibility for apprehension. I would like to step back, and overlay this lexicon of material properties with a vocabulary of use-less things. The thing, with no recourse to use, an art object for instance, is caught between the form it appropriates and the materials and methods of its construction. For a use-less thing there can be no retreat into the comfort of a reciprocally binding relationship. In place of the plimsoll line of function; taste, and various aesthetic criteria pretend a concrete affiliation to utility. In place of two traditionally distinct material vocabularies, for the practice of art and a wider realm of things, I would like to stimulate awareness of the conscious production of value and its exclusions, not to defend an autonomous sphere. Tentatively, I suggest the apprehension of art can only take place through our experience of things. I would like to anchor the practices for art firmly within a wider sense of material culture. What we are now moving through is a fluid field of potentiality, with a set of changing procedures bracketing the manufacture of art. This is to recognise that the context, gallery, museum, or book induces the heightened awareness peculiar to arts apprehension, by effectively canceling any recourse to immediate use. 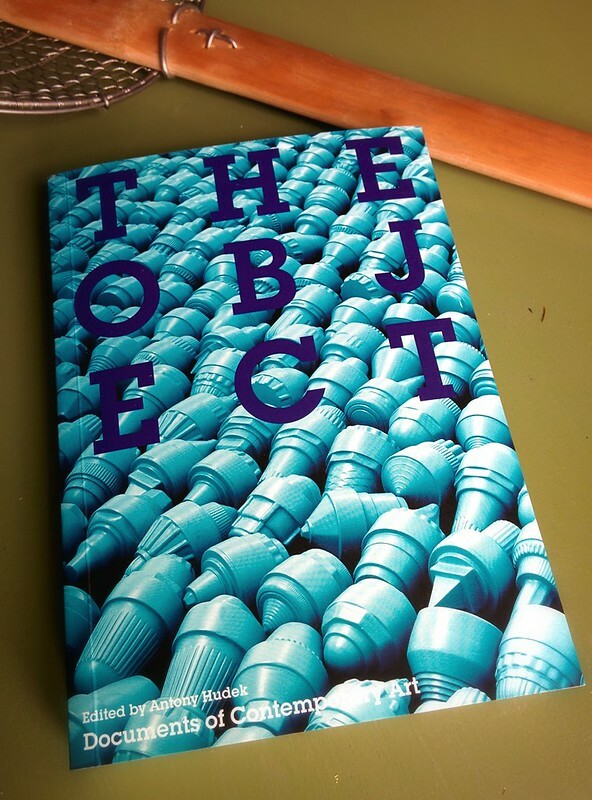 This book - like the art gallery - condemns the objects presented to their fate as signs. Perhaps to resist this condition, the visual projects enclosed mirror the tactics of the flea-market browser I introduced earlier. They wander through prescribed typologies of things.Presented here are objects extracted from the relentless tide of availability, from furniture, existing art objects, utensils,things from distant cultures, toys, a sink plunger, commodified things, found, bought or stolen things, deeply personal things, invented objects, hand made things, industrially manufactured things, things completely resistant to comprehension. The intention is to reflect the playful collisions of objects within material culture, weaving metaphor into dumbness, exposing fissures and leaving ruptures in the otherwise seamless flow of things. An alternative is to concentrate on the minute difference in activities of use. Activities that slip below the received level of comprehension. What both tactics share - even through their suspension in photography- is the desire to retain the rich `babble of use`. They attempt to frustrate the introduction of arbitrary sign exchange, and instead ambush the maximum of readings between the energy released on contact between things. I may go further and suggest the objects depicted appropriate the alibi of use. Alibi, as the term implies is to reach for corroborative evidence, to lend some credibility to a weak and unsubstantiated event. By calling to mind objects cemented in specific, but disparate contexts, the alibi of use is an endeavour to return the referent to representation. What I would want to submit through the range of activities encompassed by this book is that things may offer temporary resistance to, and allow the introduction of some responsibility into, the current endless play of ungrounded representation. This book sets itself in opposition to the arbitrary nature of the object as sign in our highly commodified material culture. While simultaneously acknowledging material culture as perhaps the natural resting place of representation. 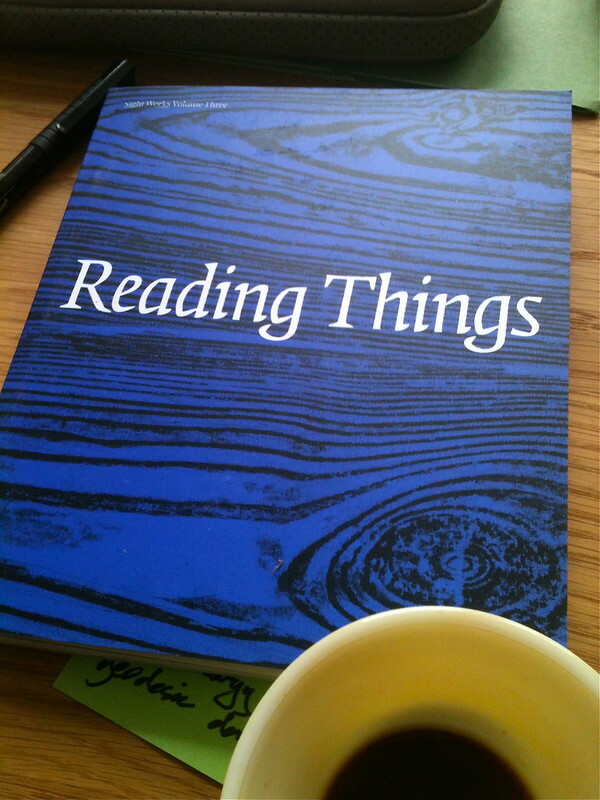 Reading Things: the alibi of use is the introduction to Reading Things, Sight Works Vol.3. ed Neil Cummings, Chance Books, London 1993, ISBN 0-9513932-3-5. See my and Richard Serra's intervention in the publication TO CONTINUE. Read Linda Lai's interesting .pdf synopsis of the text from 2008. Editing Reading Things focussed a lifelong interest in the materials of culture, the institutions we evolve to organise those materials, and I've recently written about jigs, and intervene in the #ObjectOfTheWeek on twitter.